Home / Uncategorized / What is the state of food security and nutrition in the world? What is the state of food security and nutrition in the world? Read the FAO report How close are we to #ZeroHunger? The state of food security and nutrition in the world (2017) . The online report has numerous chart that can be downloaded, such as the one here. After steadily declining for over a decade, global hunger appears to be on the rise, affecting 11 percent of the global population. 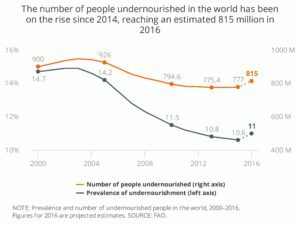 In addition to an increase in the proportion of the world’s population that suffers from chronic hunger (prevalence of undernourishment), the number of undernourished people on the planet has also increased to 815 million, up from 777 million in 2015. The report provides information on stunting, wasting, overweight children and adults, anemia, and breastfeeding. The data isn’t directly available on the web page, but some of it can be found in the full report. Previous Where does the U.S. rank on the world press freedom index? Next How does air pollution compare by country?